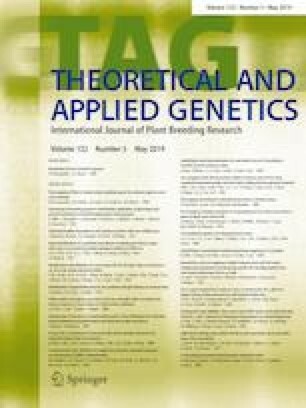 Two adult plant stripe rust resistance QTL, QYrto.swust-3AS and QYrto.swust-3BS, were identified and mapped in common wheat cultivar Toni. The two QTL were located to corresponding positions in the wheat physical map position based on flanking SNP markers. Stripe rust, caused by Puccinia striiformis f. sp. tritici (Pst), is one of the most important foliar diseases of wheat. Characterization and utilization of resistance genes are the most effective, economic and environmental-friendly way to control the disease. The wheat cultivar Toni resistant at the adult plant stage to predominant Chinese Pst races was crossed with the susceptible genotype Mingxian 169. A recombinant inbred line population comprising 171 lines was tested in the field at three locations in the 2016 and 2017 crop seasons. The Affymetrix Axiom® 35 K single-nucleotide polymorphism (SNP) Wheat Breeder’s Genotyping Array was used to map quantitative trait loci (QTL) for adult plant resistance to stripe rust. Inclusive composite interval mapping identified stable QTL QYrto.swust-3AS and QYrto.swust-3BS that explained 31.6–48.2% and 21.9–56.3% of the variation in stripe rust severity and infection type, respectively. The two QTL regions were anchored to the wheat IWGSC Ref Seq v1.0 sequence. QYrto.swust-3AS was localized to a 2.22-Mb interval flanked by SNP markers AX-95240191 and AX-94828890. Among 65 HC (high confidence) annotated genes in this region, 11 (16.9%) contained NB-ARC domains and 9 (13.8%) contained protein kinase domains and thus could contribute to disease resistance. QYrto.swust-3BS was localized to a 4.77-Mb interval flanked by SNP markers AX-94509749 and AX-94998050. One hundred and thirty three HC genes are annotated in this region. Among them, 14 (10.5%) protein kinase domain genes may contribute to disease resistance. The linked markers should be useful for marker-assisted selection in breeding for resistance. Xinli Zhou, Tian Hu have contributed equally to this study. The online version of this article ( https://doi.org/10.1007/s00122-019-03308-1) contains supplementary material, which is available to authorized users. This project was partially funded by the Open Project of the State Key Laboratory of Crop Stress Biology for Arid Areas (No. CSBAA2017012), Longshan Academic Talent Research Support Program of SWUST (No. 17LZX5), PhD Foundation of Southwest University of Science and Technology (No. 16zx7162), The National Key Research and Development Program of China (2017YFD0100905) and Breakthrough innovation of wheat breeding materials and methods (2016NYZ0030). This study did not include human or animal subjects.